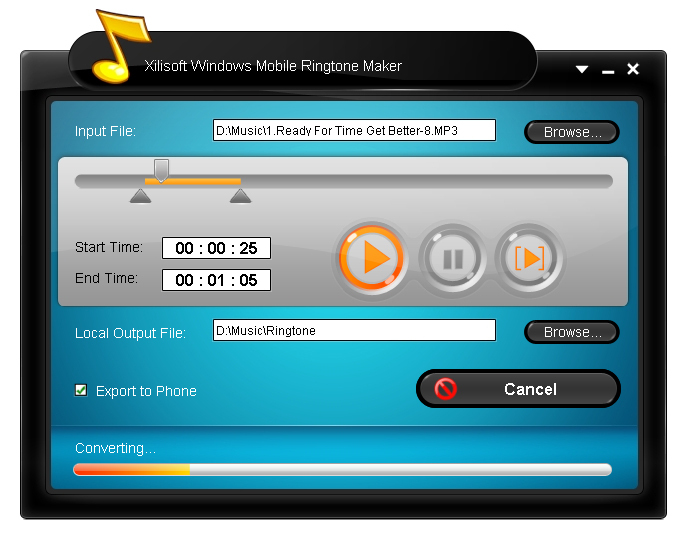 Xilisoft Windows Mobile Ringtone Maker can help you make your own Windows Mobile Ringtone easily! this Windows Mobile Ringtone Make has great capability of converting AVI MPEG WMV DivX MP4 H.264/AVC AVCHD MKV RM MOV XviD 3GP WMA WAV RA M4A etc. to MP3 files for your Windows Mobile device ringtones, and transferring ringtones to your Windows Mobile device like Nokia, Samsung, Motorola, T-Mobile, Blackberry and so on directly after converting. ...... device directly after making ringtones according to your own need. 1. This ringtone maker for Windows Mobile supports all sorts of Windows Mobile devices: Nokia, Samsung, Motorola, T-Mobile, Blackberry and so on. You can make ringtones for these devices and thus you can hear the music you love when others call you. 2. This Windows Mobile ringtone converter is capable of transferring converted ringtones to your Windows Mobile device automatically after making ringtones. 3. If you only love a segment in a movie or music file, just get the segment you want by drag and drop or by setting start time and duration, and convert it to a ringtone for your Windows Mobile device. 4. With the built-in music player, you can listen to the loaded or trimmed file before conversion to see whether it's the music segment you want to hear when someone calls you. Qweas is providing links to Xilisoft Windows Mobile Ringtone Maker 1.0.12.0531 as a courtesy, and makes no representations regarding Xilisoft Windows Mobile Ringtone Maker or any other applications or any information related thereto. Any questions, complaints or claims regarding this application Xilisoft Windows Mobile Ringtone Maker 1.0.12.0531 must be directed to the appropriate software vendor. You may click the publisher link of Xilisoft Windows Mobile Ringtone Maker on the top of this page to get more details about the vendor.